Do you ever start out to make one dish and then end up making something entirely different? I started out to make a lemon chicken casserole with green beans and new potatoes, but then remembered that I had used all the lemons making lemonade. I decided to substitute limes, but then that meant I had to change up the spices. Once I had changed the spices, I decided I needed to switch out the veggies for something that would go better with my new seasonings…and by the time I was done the only thing left from my original recipe was the chicken. Add the oil to a frying pan. Place chicken thighs in pan and sprinkle with seasoned salt, garlic powder, and pepper. Brown chicken on both sides. 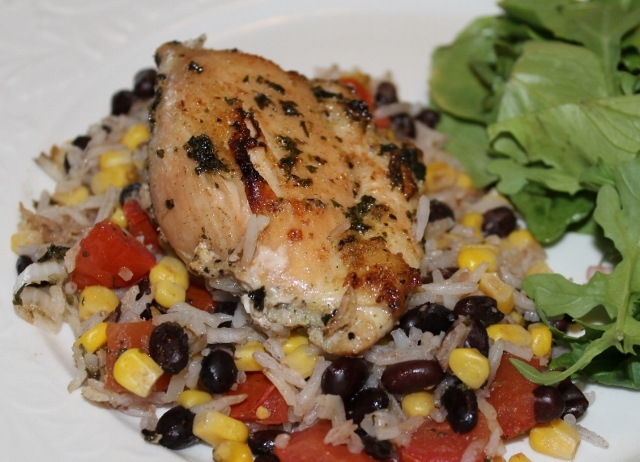 Combine rice, beans, corn, tomato, and onions in a greased roasting pan. Combine lime juice, zest, chicken broth, cilantro, honey, and cumin in a small bowl. 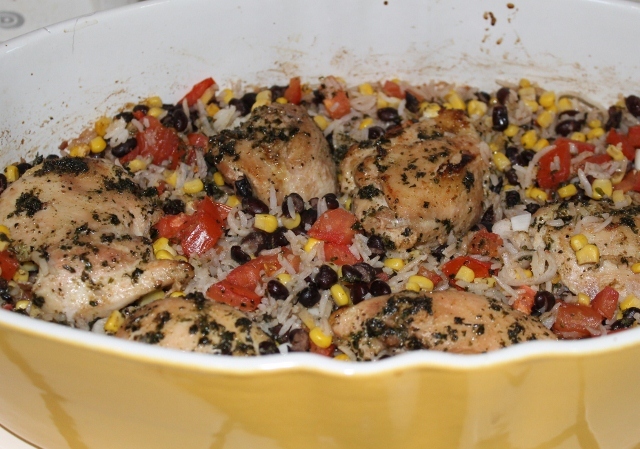 Place chicken on the rice and bean mixture. Drizzle lime mixture over the chicken and rice mixture. Bake at 450 degrees for 30 minutes or until chicken is cooked through. I served the casserole with a garden salad. I don’t always make this with chicken, but the rice base you have is one of my favorites. I think lime complements it perfectly, so to see a lime chicken added to it doesn’t surprise me at all. It sounds and looks delicious. Just to clarify the temperature-it’s really 450 degrees? Yes, it really is 450 degrees. It is counter-intuitive, but I like cooking hot and fast in the summer because it reduces the amount of time the oven is on. When I decided to cook the casserole it at that temperature, I was a little worried that the veggies might come out smushy (my highly technical cooking term) but they were just fine. You would be surprised, but I’ve never made a casserole. However, we make ‘biryani’ almost the same way! Cook the vegies and the rice separately, and the combine them together and set it in the over for half an hour. I would love to tyy this one and see how different it is from the ‘biryanis’ that we cook……. I have never heard of a biryani before, but it sounds delicious! Do you think this would work with Quinoa substituted for the rice? I think quinoa would be a great substitute! I love quinoa and have used it with this flavor combination in other dishes. Are the chicken thighs with or without bones? Does it matter which you use? I would use whatever chicken is on sale. and adjust the time if you used a thicker cuts. I used boneless/skinless chicken thighs because I found them marked down by 50% in a manager’s special. 🙂 I prefer chicken thighs because they are more flavorful than breasts, cost less, and are less likely to dry out when baking. We just had this tonight for dinner, and it was delicious! Thanks! I made this for dinner last night and it was amazing. Thanks so much for the great dish, will be added to our favorites! I used chicken breast and grilled it before hand, the taste was fantastic.